The TriSystems: Rangers are On Patrol! 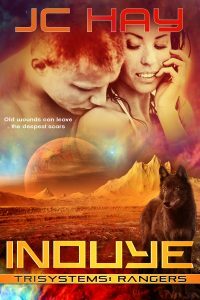 Today marks the release of Inouye, the first book in my TriSystems: Rangers series. I’m excited about this for a number of reasons. Firstly, because this setting has become my favorite place to write, and I’ve already got a long series arc planned for these books, and a spin-off series in the works. Secondly, because this is the same series that will be featured in next month’s Pets in Space anthology. If you’ve been following along on some of my posts for that series, you’ll understand that these books are my love-letter to dog owners, and military K-9s. Now’s the time to get onboard the Hunting Cry and meet the rangers of Fireteam Bravo, brave soldiers who risk their lives and their hearts to keep the worlds of the TriSystems safe. Pick up your copy at your favorite e-tailer!